Cameron manufactures and supplies pressure control systems to the oil and gas industry. The company also provides a wide range of onshore and offshore drilling products and services, in addition to land and platform production systems, separation, processing, and treatment systems, subsea production and processing systems, and a variety of valves and actuators. Cameron offers fully integrated and application-specific offshore drilling systems, which deliver reduced complexity and risk on new-builds, increased reliability and lower total cost of ownership. 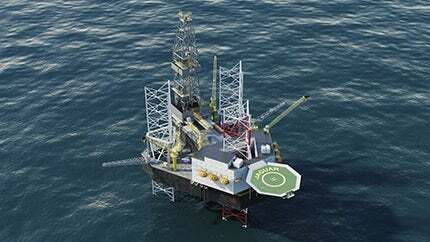 The company’s high-spec, jack-up designs are capable of drilling 40,000ft wells and incorporate a full suite of automated drilling technologies, which are operated and monitored remotely from advanced control rooms designed according to customer specifications. Cameron’s large-bore 20K and 25K blowout preventer (BOP) drilling systems provide production opportunities in areas with such extreme high-pressure characteristics that they were formerly considered beyond development. Suitable for high-pressure, high-temperature (HPHT) offshore applications, Cameron will have five industry-first ultra-high pressure BOPs operating in the Gulf of Mexico by the end of 2015. When subsea control point of distribution (POD) related issues result in a stack being pulled for unplanned maintenance and repair, it leads to increased financial and operational costs. By adding BOP control redundancy, the operational availability of the subsea control system improves to as much as 98%. In addition, the likelihood of a POD-related stack pull has been reduced by up to 73%. Subsea equipment is designed to operate for long periods of time on the ocean floor in thousands of feet of water. For BOP stacks, planned maintenance performed on schedule usually can resolve most problems, but accurately determining stack condition and identifying potential issues while they are operational is much more difficult. Cameron’s monitoring system enables customers to monitor, record, and access subsea BOP stack conditions while the stack is deployed. Cameron developed a conductor sharing wellhead that enables the drilling of up to three dual completion wells from a single slot, saving up to 25% on individual well costs while reducing platform size requirements. For processing platforms and floating production storage and offloading vessels (FPSOs), Cameron’s CO2 separation systems have a smaller footprint, lower weight, process a wide range of feed streams and require substantially less maintenance than competitive technologies. The company’s electrostatic treaters provide increased treatment capacity, higher tolerances to net crudes and improved dehydration performance when compared with conventional electrostatic solutions. When effective and efficient treatment of oil-contaminated water and produced water is needed, Cameron also offers a patented compact flotation unit technology at a substantially reduced footprint and weight than conventional water treatment systems. For enhanced oil recovery (EOR) operations using seawater injection, the company’s compact and lightweight deoxygenation system helps prevent corrosion and can be installed between module decks.